1 What is Acid Reflux? 3 What are the complications of GERD? 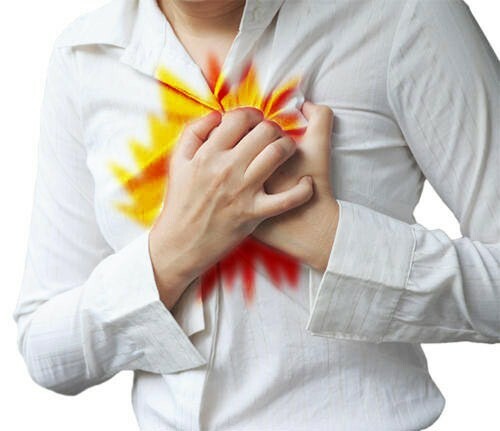 Acid reflux is a condition that occurs as a result of acid from the stomach leaking up into the esophagus, a muscular tube that connects your throat to your stomach. There are many symptoms associated with acid reflux. Heartburn, or a burning sensation in the lower chest area, is the most common symptom. Other symptoms include an acidic taste in the mouth, indigestion, and sore throat. Severity and frequency of acid reflux symptoms vary from person to person. For some people, acid reflux occurs occasionally and can be prevented with simple lifestyle changes, or managed with over-the-counter medications when symptoms occur. For others, acid reflux occurs frequently and symptoms are more severe, requiring long-term medication use, or in extreme cases, surgery. In order to understand acid reflux, it is important to understand the process with which food travels from the mouth to the stomach. When we eat, chewed food passes from the mouth through the esophagus and into the stomach. The stomach is lined with cells that produce acid to help with food digestion. While the contents of the stomach are extremely acidic, the stomach itself is protected by a mucus lining. This mucus lining, produced by the cells that line the stomach, provides a barrier to protect the stomach itself from its highly acidic environment. The esophagus, however, does not contain a protective lining. For this reason, if the acidic contents of the stomach rise up into the esophagus, symptoms of acid reflux may occur. 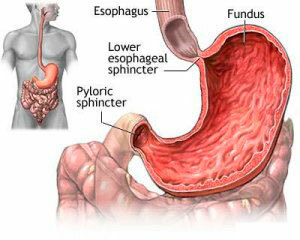 The stomach and esophagus are joined by a muscular band called a sphincter. This is a circular band that allows food and saliva to pass into the stomach while preventing the acidic contents of the stomach from rising back up into the esophagus. The sphincter is usually in a tightened, closed state. When food travels down the esophagus, the sphincter temporarily releases to allow food and saliva to pass through. Once food has passed into the stomach, the sphincter tightens again to prevent the contents of the stomach from rising back up into the esophagus. If the sphincter relaxes abnormally or weakens, the acidic contents of the stomach can enter the esophagus, and reflux occurs. Acid reflux occurs when stomach acid rises up into the esophagus. Acid reflux occurs when the acidic contents of the stomach rise up into the esophagus. Oesophagitis can occur when the lining of the esophagus becomes irritated and inflamed, often due to acid reflux. The lining of the esophagus can withstand small amounts of acid from the stomach, however, the threshold of acid needed to experience symptoms varies from person to person. Some individuals are more sensitive and will experience symptoms of with only minor reflux, while others will only begin to experience symptoms once reflux becomes severe. Many people will experience indigestion or heartburn at some point in their lives, commonly attributed to consuming too much spicy food or laying down after eating a large meal. However, acid reflux can also occur on a regular basis without a known trigger. Severe and frequent symptoms of acid reflux are referred to as GERD or Gastroesophageal Reflux Disease. GERD is considered a chronic condition, where individuals experience reflux and severe symptoms on a frequent basis. GERD is considered to be one of the most common diseases encountered by Gastroenterologists. It is estimated that 10-20% of the American population suffers from symptoms of reflux or GERD. Chronic reflux can often be managed by a combination of lifestyle changes and over-the-counter medication but may require prescription medication or even surgery in severe cases. Though there is no specific ethnicity or country at a greater risk of developing GERD, it is more prominent in Western countries. GERD can occur at any age, but the severity of symptoms may decrease after the age of 50. There does not seem to be a difference in the incidence of GERD between males and females, however, there is a strong association between symptoms of GERD and obesity. While medications can be an effective treatment to manage symptoms of GERD, it does not treat the underlying cause of these symptoms. This means that symptoms will likely return once the individual stops taking these medications. Individuals at greater risk of acid reflux include those with abdominal obesity, pregnant women, smokers, or those with stomach abnormalities. Common acid reflux triggers include consuming large meals, spicy foods, high-fat meals, coffee or alcohol, laying down after eating or wearing tight-fitting clothing. GERD has also been found to be common in patients with Irritable Bowel Syndrome. While acid reflux or GERD is typically not serious, its symptoms can have a significant impact on quality of life. Frequent, severe pain after eating, sleep disturbances, and troublesome symptoms have been linked to impacting the quality of life for GERD patients. Esophagitis: an inflammation of the esophagus which occurs when the lining of the esophagus becomes irritated and inflamed from exposure to stomach acid. Esophageal Stricture: narrowing of the esophagus related to scar tissue build up. Barrett’s Esophagus: a condition where damaged cells in the wall of the esophagus are replaced by cells similar to that of the intestinal lining. Though uncommon, this is associated with an increased risk of developing esophageal cancer and needs to be monitored. Respiratory problems: stomach acid from the esophagus can enter the lungs causing symptoms including difficulty breathing, asthma, coughing or wheezing, or infection. Though acid reflux is typically not serious, it is best to consult your doctor if you experience frequent symptoms. If you experience symptoms of chest pain, seek emergency treatment immediately.